I purchased the book, The 52 Lists Project for my 43rd birthday in October. This book focuses on weekly journaling based on lists. I love making lists and thought this sounded like a great way to remember a year. I plan to complete a list every week for this next year. Even though the journal begins in Winter with Week 1, I started my list during Fall with Week 40. So, I’ll be moving through the book a bit backwards, which is hard for my organized brain, but I didn’t want to be writing about winter topics in spring or summer in winter. I’ll be sharing my lists here. To see my previous lists, click on the tag 52 Lists Project at the bottom of this post. It’s my hope that by sharing my lists, you’ll get to know me a bit better and maybe be reminded of something that brings you joy! Some weeks the topics may be too personal to share completely on here, but I’ll at least tell you about the lists and some of the things on it. I’ve gotten behind on sharing my lists with you, but I am keeping up with writing them in my journal. So, I’m going to share Lists 44, 45, and 46 with you today. 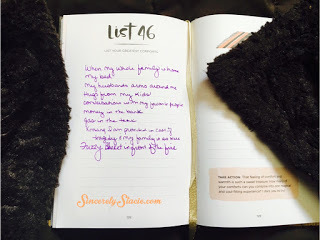 List 44 is all about the Words that Warm My Spirit. I quickly knew some of those words that I just love to say and hear. They incite emotion and make you feel good if someone says them about you. At the end of each list, the author offers an idea to expand on that week’s list. This week’s action plan is to highlight the top five words that resonate the most with your experiences this past year. Then to underline them those top five that I want to focus on and experience in the year ahead. I will mark those with an * after them. 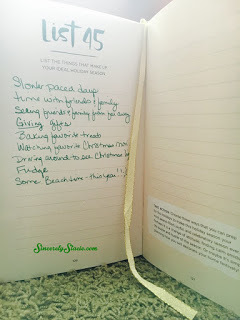 List 45 shares my Ideal Holiday Season. Honestly, when I made this list I was feeling extremely overwhelmed with my schedule and all that I had to do to prepare for the holidays. My spirit wasn’t very Christmassy and I didn’t come up with very many items. But, when I look back on my list, I may not have experienced all of them in the way I expected to, but I did have a glorious holiday. The action plan for this week was to choose three ways that I can prep to make it my most peace-filled, joyful and celebratory season ever. Either by changing my attitude, finding calm or simply planning it out. There were a few of the items that I wasn’t able to do, but cutting them out allowed me to spend more time doing other things, and there is always next year, right? Some beach time, which I got this year! 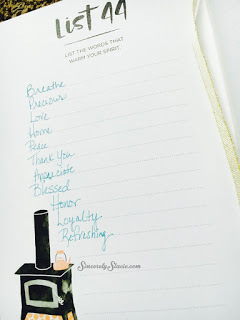 List 46 shares about my Greatest Comforts. The action plan is to combine as many of these things into one magical and soul-filling experience. I’m waiting for our next snow day to experience some of them!